Landvertoningen op de Westkust van Sumatra, by de Keyzers of Lampons Piek. This is an impressive example of Joannes van Keulen's 1728 chart depicting the elevations of the western coast of Sumatra, Indonesia. 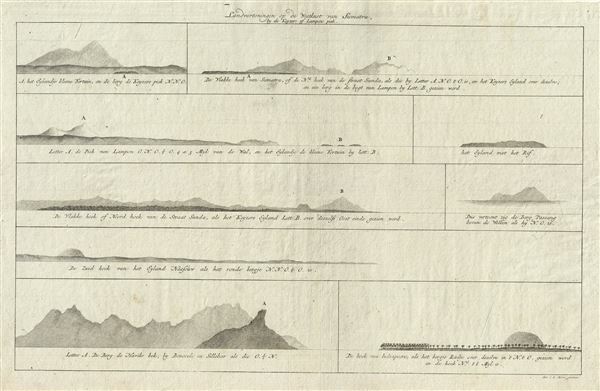 The chart includes nine beautifully rendered elevation profiles, each depicting a different region of western Sumatra, including a profile of Indrapura (Indopuro), Mount Pasang above the clouds, Lampoon Peak, and the north corner of Sunda Strait, among others. The chart was created by Jan de Marre for inclusion in Joannes van Keulen's 1728 edition of De Nieuwe Groote Lichtende Zee-Fakkel. Keulen, J. van, De Nieuwe Groote Lichtende Zee-Fakkel, (Amsterdam).